Home → Across America → Doctors Fear: “Brett Favre needs stem cells to stop accelerated old-aging process.” Arsenio Hall offers hope. “At his current rate of aging, we feel that Mr. Favre will be at least 90 years old by this time next year.” said Dr. Hermet LaJeunesse of the American College of Aging and Maturation in Newark, New Jersey USA. Dr. LaJeunesse also worked on the team that converted singer Barry Manilow from loooking like a sicky bird. 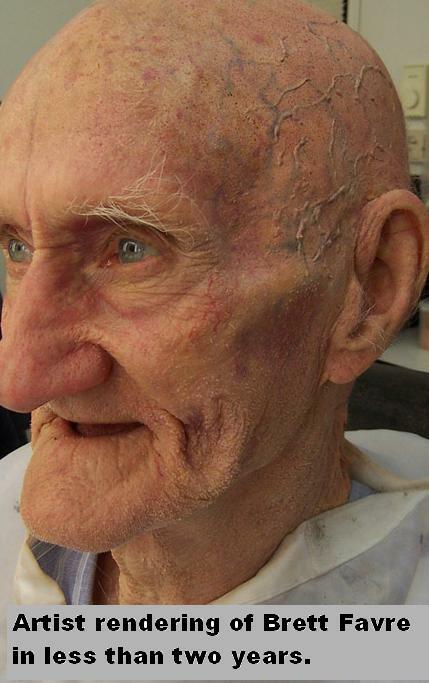 Manilow had been aging badly and had been in hiding for nearly three years. So anyway, Brett Favre is really getting old too fast and he has turned to doctors to try to stop this aging process. 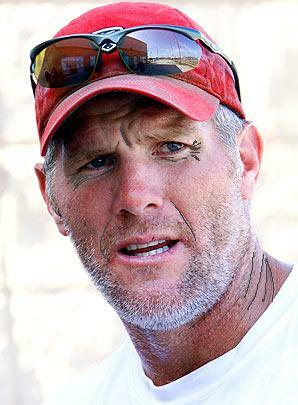 Right now many doctors and plain old everyday people assume that Favre is about 68 or 70. He looks good for a guy in his 70s, but he still looks like a guy in his 70s. “I would like to get some stem cells from Arsenio Hall,” said Dr, La Jeunesse. “I saw him recently in a TV ad where he is the spokesman for a company that rips off poor people with pre-payday loans. His career has really gone down the tubes but he looks like he hasn’t aged in 20 years. If Arsenio Hall would like to come down to our clinic, we need only to swab the inside of his cheek for some cells. We might also smack him on that same cheek for taking a paycheck from a company that is essentially a legal loan-shark that prays on inner city people with no checking accounts or credit cards.